"Bad news. That's an IRD. Instant Retirement Device. Computerized shifting sensor. Counter logic traps. Nastiest class of ticker I've ever seen." 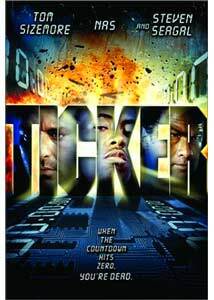 Prolific low budget director Albert Pyun (Cyborg, Kickboxer 2, Heatseeker) has cobbled together a better-than-average mad bomber flick with the 2001 release of Ticker, which is loaded with a decent cast and plenty of B-grade action. Utilizing a strong trio of movie tough guys: Tom Sizemore (Saving Private Ryan, Bringing Out The Dead), Steven Seagal (Under Siege), and Dennis Hopper (Speed, Blue Velvet), Pyun is able to control what could have easily become an ultra-cheesy mess into an almost respectable, yet still low funded, thriller. This isn't in the league of the Die Hard series, but it is far better than most of the tacky action schlock that litters your friendly neighborhood DVD rental bin. Even though much of the film is pieced together with stock footage from other projects, Pyun manages to string along a steady stream of guns and explosions, and never bothers to mire the viewer down with too much lengthy exposition. There are plenty of good old wire-snipping scenes and bombs with big LED countdown displays. In the film's opening sequence, we are introduced to cool and collected Bomb Squad leader Glass (Seagal) as he is taking part in a massive hostage recovery situation at the palatial compound of a major politico. A group of terrorists have wired the estate with sophisticated explosives, and are threatening to kill everyone inside. This is a typical pointless action scene that is only present to introduce Glass and provide some cool pyrotechnics to set the film's tone. The story then shifts ahead one year to San Francisco vice detective Nettles (Sizemore), along with his partner Fuzzy (Nas) as they encounter some potentially late night shady dealings at an import/export warehouse. Their situation also ends badly, as they encounter the film's villain, mad bomber Swann (Hopper) , his henchmen Vershbow (Michael Halsey) and Dugger (Norbert Weisser), as well as the lovely Claire (Jaime Pressly). Eventually the out-of-control, almost on probation Nettles crosses paths with the Zen-like Glass and his quirky bomb squad team and it becomes up to them to stop Swann before he destroys the entire city. In the good guy corner, Sizemore and Seagal work well together. I expected a good performance from the always engaging Sizemore; he's the kind of guy that can bring a nice mix of crazy rage that comes across as more than a little dangerous. I've never been a huge Seagal fan, but he seems to have toned down his usual pomposity for this role. He gets to mutter some weighty Zen-induced pontifications here and there, but overall his character is actually likeable, which is something I've never really noticed in any of his other flicks. I guess that the demon of advancing age has taken a step or two out of his usual trademark martial arts, because his lone hand-to-hand fight sequence here is so badly edited that it is almost laughable. Dennis Hopper, whose mad bomber turn in Speed was goofy fun, gets another chance here to crank up the hambone-meter as Swann, the man with one of the most inconsistent accents since Kevin Costner in Robin Hood. Hopper's Swann is one comically crazy nut, and when he detonates a bomb or two from a pay phone, he invokes his Madison Avenue catchphrase: "Reach out and touch someone." Even with his over-the-top style, Hopper makes a demented enough villain to carry the story along. Pyun stages plenty of action in Ticker, even if the Paul Margolis screenplay ends rather abruptly. Not a great film, but a halfway decent B action movie. This film is the equivalent of enjoying something that you know is just plain bad; sort of like eating an entire box of Twinkies when you're on a diet. Image Transfer Review: This disc is presented in a nice 1.85:1 widescreen anamorphic transfer. Very little in the way of nicks or dirt, and colors keep an even, well-saturated look throughout. Shadows don't run very deep, unfortunately, with some of the dimly lit scenes during the film's climax coming across a little too black. Minimal digital artifacts or compression issues here. Audio Transfer Review: How does Ticker sound? Well, the 5.1 Dolby Digital track dishes out a meager amount of surround effects, with most of the action taking place on the three front channels. Directional imaging, especially helicopters, adds some dimensionality, but is used sparingly. The 2.0 surround track, generally the red-headed stepchild of audio mixes, holds it's own against the 5.1 for this release. There isn't any drastic loss in spatial sound placement, nor is there any significant difference in the dynamic range. Extras Review: Normally, I would be ecstatic about a scene-specific director commentary on a low-budget action film. Not so on this disc. Director Albert Pyun and producer Paul Rosenblum leave an endless series of extended silent gaps during their track. Some of their comments are informative, such as the fact that Ticker was originally conceived as a Chuck Norris made-for-cable movie, or that some of the shots depicting San Francisco are actually South Africa. Their delivery is on the dry side, bordering on disinterest, and with the prolonged silent stretches, it made for an very dull overall commentary. Other than the commentary track, the extras include a widescreen Ticker trailer, 14 chapter stops and Spanish subtitles. I will admit that I had looooow expectations for Ticker. But I will be big enough to admit that this film is much better than I thought it would be, and I would probably classify it under a 'guilty pleasure.' It delivers most of the recommended daily requirements for the mad bomber genre caper. This is not the ultimate action thriller by any means, but it is a decent enough testosterone romp to justify killing 90 minutes to watch. My only overall complaints: a weak commentary track from director Albert Pyun and far too little Jaime Pressly.